Discovering Life Skills is an exploratory overview of Family and Consumer Sciences designed for middle school use. Discovering Life Skills can be used for a six-week, nine-week, or semester course. The 25 chapters correlate to the FACS modules sold by a variety of vendors. See the Module Crosswalk in the Teacher Resource Guide. 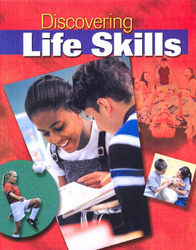 The content of Discovering Life Skills may be used along with popular modules often used in middle schools. Career Choices pages provide information about four careers related to the chapter, along with activities that link career choices to school and the workplace. Discover pages offer students an opportunity to apply their learning to a practical life skill by developing and implementing a plan and evaluating the result. Closer Look provides students an in-depth view of need-to-know topics such as how to say "NO", handling stress, organizing your closet, and practicing good citizenship skills. Internet Activities encourage students to search for information on the Internet related to the content of each chapter. Making Connections provides the curriculum links between Family and Consumer Sciences to Math, Science and Social Studies. The content of Discovering Life Skills may be used along with popular modules often used in middle schools. Career Choices pages provide information about four careers related to the chapter, along with activities that link career choices to school and the workplace. Discover pages offer students an opportunity to apply their learning to a practical life skill by developing and implementing a plan and evaluating the result. Closer Look provides students an in-depth view of need-to-know topics such as how to say "NO", handling stress, organizing your closet, and practicing good citizenship skills. Internet Activities encourage students to search for information on the Internet related to the content of each chapter. Making Connections provides the curriculum links between Family and Consumer Sciences to Math, Science and Social Studies.